This is an optional Traxxas CV Driveshaft Set, and is intended for use with the Traxxas T-Maxx 3.3, Revo 3.3, E-Maxx and E-Revo trucks. 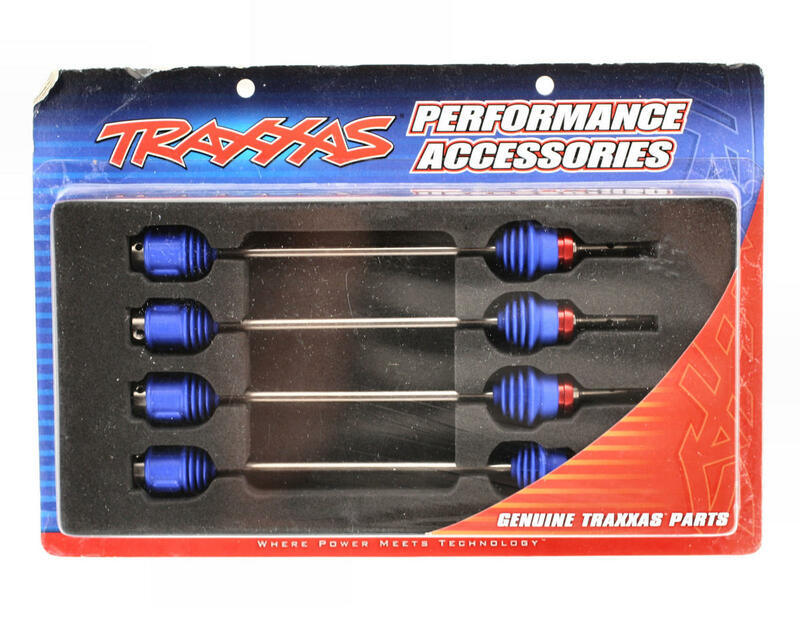 Traxxas Steel Constant Velocity Driveshafts are designed to handle the extreme horsepower and articulation that a T-Maxx or Revo can dish-out. 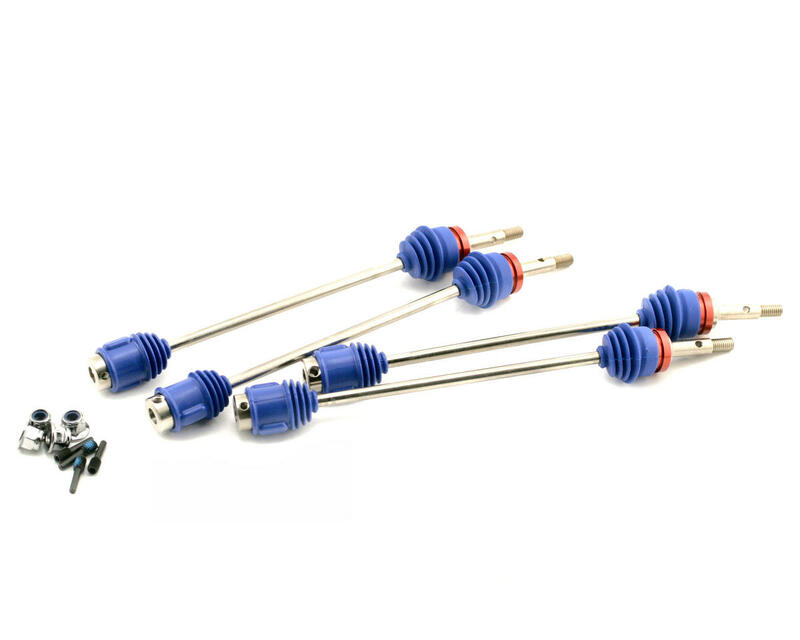 The inner and outer U-joints are lubricated and sealed by a rubber boot for maximum protection against the elements, and the U-joint pins are held captive by a lightweight aluminum sleeve so you never have to worry about losing a pin. The nickel plated steel shafts, blue silicone boots, and red-anodized aluminum accents not only look good, they are designed to exacting specifications for ultimate strength and performance. These are simply the most advanced steel CV driveshafts available for the Maxx and Revo trucks. I found that these wont work with the RPM True Trac rear. you cant adjust them enough to stay in the dog bone. the fronts work with RPM axle carriers if adjusted in enough to keep the shaft in enough. These are a good product. However on big jumps or general bashing they have popped out a few times and punctured the boot. I run standard rear aarms and RPMs in the front with standard rockers. It maybe my camber and toe setup but I think they could be better. These are probably the one good thing traxxas has made. I have the new 3.3 and everything had broke on it. These drive shafts have been great for me so far. I font have rpm gear but from the reviews I've read they don't fit. They do fit stock nice and i have had great luck with them. True upgrade from stock for sure! Robert, do you understand the kind of torque being put through an axle shaft when it is attached to the mamba monster running on a 6s lipo????? There is a reason they said it was for tho revo and not the e-revo. Other than that, great product like always from traxxas. great for racing and bashing on a small scale but once I hit the big jumps at the skatepark they all bent. damaged one of my 17mm adapters" rubbing from bent cvd" just bent them back in a vise.easy to install "you have to loosen your caster blocks to fit them in because they dont telescope" but at least you dont have to take the whole car apart like whith the mini revo cvd's whould rate them 5 stars if they were made of titanium.